Which royal ruled the waves? Two European royals went head-to-head here in a battle to rule the waves for the final act of the Volvo Ocean Race 2014-15 today (full story below). GOTHENBURG, Sweden, June 27 – Two European royals went head-to-head here in a battle to rule the waves for the final act of the Volvo Ocean Race 2014-15 today. 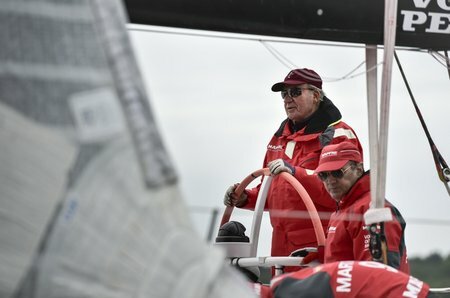 His Majesty King Juan Carlos of Spain joined the crew of Spanish challengers, MAPFRE (Iker Martínez/ESP), in a seven-strong fleet for the Inmarsat In-Port Race Gothenburg, which also included Team SCA (Sam Davies/GBR). The Swedish-backed, all-women’s crew welcomed the heiress to the Swedish throne, Victoria, Crown Princess, on their boat in a race that was hampered by a lack of wind on the course. Neither of their regal passengers was allowed to help sail their boats, but both had the perfect spectators’ positions onboard. King Juan Carlos, 77, who ‘retired’ in 2014 to make way for his son King Felipe, said, before boarding, that he had not had the opportunity to sail on a racing yacht for four years. He is well known for his love of sailing and a prominent supporter of the race, so would have fully appreciated Iker Martínez’s expert strategy in claiming third place. The Spanish boat, however, could not keep up with the Crown Princess and Team SCA who finished second behind winners, Team Brunel (Bouwe Bekking/NED).